Halloween can be a fun time of year for many people, but the scary images and noises are not always fun for children who are on the autism spectrum. The Autism Society of Indiana has created a list of tips for parents or caregivers of children with autism that might help their loved one enjoy the holiday without some of the scary parts. Costume Choice: If your child has not yet chosen a costume, you might suggest one that is related to an existing area of interest. If your child likes a particular book, game or sport, they will probably enjoy dressing up like their favorite character or athlete. This will provide built-in excitement to the experience. Dress Rehearsal: Practice putting on your child’s costume, so he or she is familiar with it. Start letting your child wear the costume around the house a couple of weeks before Halloween, so when the holiday arrives it is an accepted routine. If the costume has tags that scratch or other aspects that cause a problem, you will have sufficient time to solve the problem and alleviate any sensory discomfort or distraction. Role Play: Practice in advance the Trick or Treat process of requesting and accepting the treat. This will help your child understand and remember what to say and do while Treat or Treating. Siblings: If you have other children who are not on the spectrum, consider having them do their Trick or Treating with their friends, if they want to go for a longer time or visit different places. This will help reduce any pressure a different agenda might present. Decorations: Considering gradually decorating your house and yard in the days and weeks leading up to Halloween, so your child is not overwhelmed by too many potentially scary images in and around your property. More Treats: You and your child can bake and decorate Halloween cookies or cupcakes before the holiday arrives, to gradually build up the fun factor as the special day approaches. 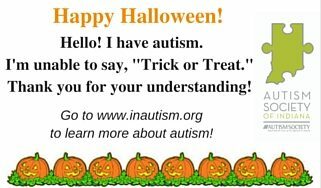 The society also has created a special card that can be printed and used during Trick or Treating. Print the above image to use the card and share with others.